Hi, Thank you, friends and viewers. Today I will post how to make kaju katli/kaju barfi. Kaju katli or kaju barfi is a special sweet made during Diwali festival. It is made with cashew nuts. During Diwali, people distribute sweets among friends and family. Diwali without Kaju katli or kaju barfi and ladoo are the most important and a must-haves among them. 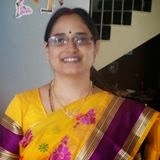 I like kaju katli very much. I want to give a try long back but feared on spoiling it. One of my neighbouring aunt gave simple tips. I also searched in different blogs for the recipe. At last, I tried my hand and it came very well. I felt happy and my BP shoots up to normal, which was always on lower side otherwise, out of excitement. This is the first time I am making, so prepared very less quantity. I could make only 15 pieces, but we can increase the quantity according to our requirement. I also did not spread silver vark as I did not have it at that time. 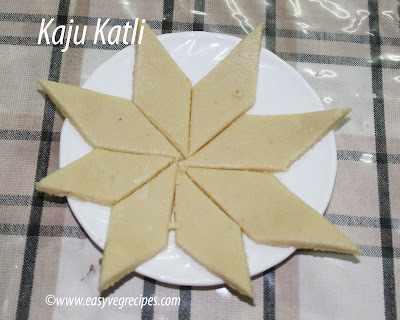 Kaju Katli/Kaju Barfi -- sweet made with cashew nuts and sugar. Make powder of cashews in a mixer grinder. Do not over grind them, as they release oil. Grind them once and sieve.Repeat the same with the remainings also. Keep the cashew nut powder ready. In a wide and thick bottomed pan, add sugar and water. Now slowly add cashew nut powder, while stirring continously. Keep stirring it continously on a low flame till the mixture turns into a mass. At this stage check the consistency by taking a small portion of it into a spoon and let it cool for a while. Once cooled, if it can be made into a small ball without sticking to the fingers. This is the right consistency. If the said consistency reached, remove from the flame and transfer the cashew dough into a greased surface or to a plate. Let the dough cool enough to handle with hand, grease hand and knead it for two to three minutes. So that the entire dough turns into a smooth and soft. Transfer this dough onto a butter paper or baking sheet. Cover it with another baking sheet. Using a rolling pin, gently roll it to get 3 to 4 mm thickness sheet. Adjust the edges with a knife to make them also smooth. Let it cool completely. Once cooled, cut the dough sheet into diamond shape. Serve and enjoy the kaju katli/kaju barfi any time.